News | New Age Marketing Inc.
Charlotte NC, October 2018 New Age Marketing Inc announced today that Brian Johnson has joined as a Director of Operations. New Age Marketing, the leading marketing and advertising firm in the Charlotte, NC area, has always regarded charitable giving and community service as one of the core values of their corporate culture. New Age Marketing, Inc. has outgrown their Mint Hill location for the 2nd time since its opening in March 2016. 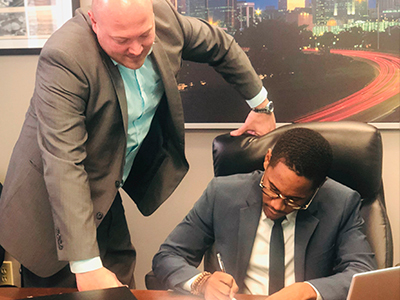 New Age Marketing, Inc., continues to raise the bar in North Carolina as they partner with a local organization, Urbanities. New Age Marketing, Inc., continues to make a name for themselves as the most prestigious marketing firm in North Carolina. New Age Marketing Teams up to Fight Breast Cancer! The team met for a weekend in Orange County, CA for a dinner cruise, networking, cocktails, and fundraising. New Age Marketing employees team up with Charlotte Urbanites Ministries to clothe the hungry. 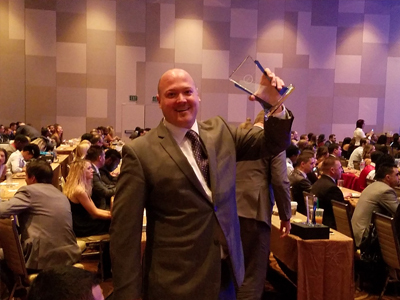 Presidential Award winner shows off his award at the Aria Resort and Casino in Vegas. 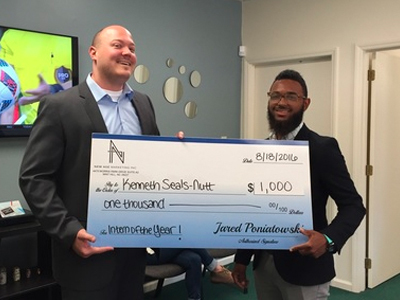 CEO Jared Poniatowski presents the intern of the year scholarship award to Kenneth Seals-Nutt. As the weather warms up in Charlotte, New Age Marketing brings the heat as North Carolina's fastest growing marketing firm. New Age Marketing Inc., or NAM, a marketing company that performs outsourced sales and marketing for corporate clients in the satellite and electronics fields, has recently undergone a company-wide expansion. 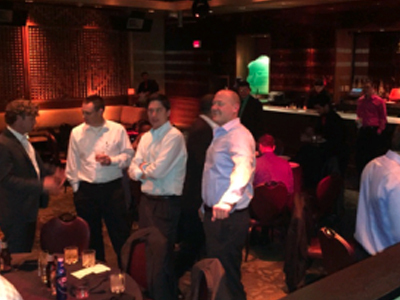 Jared Poniatowski speaks with leaders from other office across the country at Tao Restaurant and Casino in Las Vegas, Nevada at their annual dinner exclusive for the Top 50 Managers meeting. New Age Marketing, Inc. is projecting exponential growth and expansion within the first quarter of 2015. Charlotte NC, October 2018 New Age Marketing Inc announced today that Brian Johnson has joined as a Director of Operations. With just a little over a year being in the Company, Johnson’s addition expands Jared Poniatowski’s roster of creative talent. A graduate of Bethel University, Johnson began his career as an Account Manager before moving into Director of Operations. His extensive skill set will enhance Poniatowski’s existing strength, and alongside his in depth understanding of New Age Marketing Inc and best practices. Johnson also provides New Age Marketing Inc with his strong leadership skills, creative marketing ideas and knowledge of numerous client services. “I believe that the company culture is directly related with the company’s growth, I’m so thankful to have been given the opportunity to represent New Age on such a large scale. I’m truly humbled by this promotion and just thankful for all the mentorship given to me from the company and its now time to pass the torch onto others to help our people grow.” Johnson said. It is agile and forward-thinking approach for the marketing firm’s operations that resulted New Age Marketing Inc being awarded for 2018 “Firm of the Year” at R&R in Dominican Republic, Punta Cana. With Johnson’s addition, New Age Marketing plans to have continued growth and four to six new territories in the year 2019. With this expansion, New Age Marketing Inc plans to bring jobs for the Charlotte and surrounding areas. Urbanities is a Charlotte group that aims to build awareness, promote community involvement and assist the community’s most vulnerable citizens; the homeless. The organization focuses on the newest generation of workers, ages 22-39, inviting them to volunteer. Once a month, Urbanities hosts an event called, “Thankful Thursday’s”. This past Thursday, May 18th New Age Marketing associates joined the initiative. From 6:00-8:00, the partnership met at Three Spirits Brewery. One dollar from every beer and flight purchase was donated back to ending homelessness in the Charlotte area. Urbanities is widely known for hosting several events across the Charlotte area each month, including working at soup kitchens to prep and serve food. The New Age Marketing team is working diligently to attend and become an essential partner for the philanthropy group. Jared goes on to explain that the core philosophy of New Age Marketing was built on principals of giving back and reciprocal investment to achieve a larger goal. “It is our duty, as entrepreneurs, to take what we have learned from and give it back to the newest of associates. Going hand in hand with that reciprocal investment, is teaching these associates the importance of community and friendship. Understanding that our business would not have a future without our community, is paramount,” he explains. The company’s community outreach initiatives, they assure are just beginning. Stay tuned for the next great wave of involvement from New Age Marketing, Inc.
Charlotte, NC, June 06, 2017 (GLOBE NEWSWIRE) -- New Age Marketing, Inc. has outgrown their Mint Hill location for the 2nd time since its opening in March 2016. “Our goal was to open a second branch here in the Charlotte area in January of 2018, but in order to keep up with our client’s needs, we will be officially opening our Huntersville office on June 1, 2017.” said Jared Poniatowski, CEO of New Age Marketing, Inc.
“My team and I couldn’t be more excited to assist in the launch of the new branch! With the opening of the Huntersville office, we will be able to spread the New Age brand management services into more and more partner locations throughout the greater Charlotte area.” said Soto. New Age Marketing currently has partnerships from Hickory, Kannapolis, Mooresville, Rock Hill, Columbia, and everywhere in between, and is going to be adding two more Fortune 500 clients to their already impressive list. The New Age team shows absolutely no signs of slowing down, as they are in the process of adding another office in Columbia, South Carolina by the end of Summer 2017. CHARLOTTE, NC, June 12, 2017 (GLOBE NEWSWIRE) -- New Age Marketing, the leading marketing and advertising firm in the Charlotte, NC area, has always regarded charitable giving and community service as one of the core values of their corporate culture. It is no wonder then, why Director of Operations, Jared Poniatowski, decided to participate in a philanthropy event while also attending a national conference in Newport Beach, CA earlier this year. Poniatowski was selected as one of the top performing managers in his region to attend the national conference which mostly focused on branding, resource allocation and corporate culture. However, the last topic of meeting, philanthropy and community involvement, stuck out to the director at New Age Marketing. After the meeting concluded, managers wishing to participate joined together for a fundraising dinner and yacht ride dedicated to breast cancer research. Jacque Balbas-Ruddy, ambassador for breast cancer research and the night’s guest of honor, gave her testimony during the dinner portion of the night and explained how their donations affected those afflicted with the disease. According to the Susan G. Komen website, since breast cancer awareness has spread and fundraising efforts have risen, there has been a 38% decline in mortality of those diagnosed with breast cancer. As Balbas-Ruddy explained at the event, the money raised would go to support patients that have the least resources available to them: uninsured, under insured and low-income women and men. 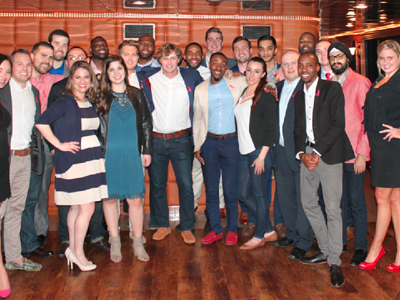 All of the proceeds of the night, including the dinner and drinks, were donated by the company to the cause. In addition, the company also vowed to match the total amount raised, which resulted in a little over four thousand dollars being donated that night. 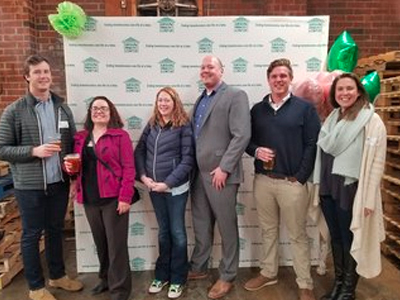 Since the event, Poniatowski has continued to search for new ways to become involved in both national and local charities in the Charlotte area. With the help of his Director of Human Resources, Ashley Withey, they have succeeded in making community involvement something that their team is excited about. Coming into the third quarter, Poniatowski has goals to continue growing their philanthropic horizons, as well as the company as well. According to the director, New Age Marketing will be expanding to Huntersville, NC in just a matter of weeks. With a new office underway, Poniatowski hopes that the value charitable giving will be passed on to future generations of the company. New Age Marketing Managers and Partners Team up to fight breast cancer! The team met for a weekend in Orange County, CA. A dinner cruise, networking, cocktails, and fundraising (a great way to support a good cause) "Its always important to be able to give back to a great cause, we have all known someone who as died from this terrible cancer or know someone who is currently fighting. I am glad to work with such a gracious team who cares about people like I do." Jared Poniatowski CEO. New Age and partners wrote a check for $5,000 to the Susan G. Komen foundation. New Age Marketing employees team up with Charlotte Urbanites Ministries to clothe the hungry. Cash donations and socks for the homeless in Charlotte, NC. Not to mention a few tasty beverages at the Triple C Brewery. CEO Jared Poniatowski presents the intern of the year scholarship award to Kenneth Seals-Nutt. Kenny will attend Yale University in the fall and spring semester. He will also continue to take on part time responsibilities in a new program opening near the University area. "I'm so grateful to have learned the wide range of marketing from online to face to face in retail. I picked up on various management concepts as well. I am really excited to have been asked to come back part time. I will carry what I have learned here for the rest of my life. Much appreciated."